This Crock Pot Mac and Cheese is creamy, cheesy and an easy family dinner that even our picky eaters will devour! 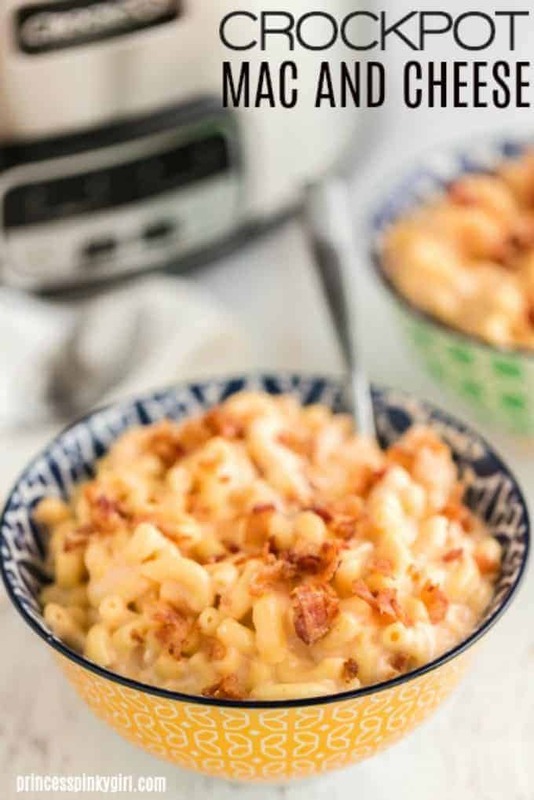 Our macaroni and cheese recipe is prepared in the slow cooker so it is easy to make and beyond delicious! It will make you never want to use a boxed mac and cheese again! This mac and cheese recipe only takes minutes of prep time and has become a weekly staple on our family meal plan. The ultimate in comfort food! Macaroni and cheese has been a long time favorite for our family! Frozen, boxed, baked…we love them all! But once we found this crock pot macaroni and cheese recipe, the game has been changed forever! 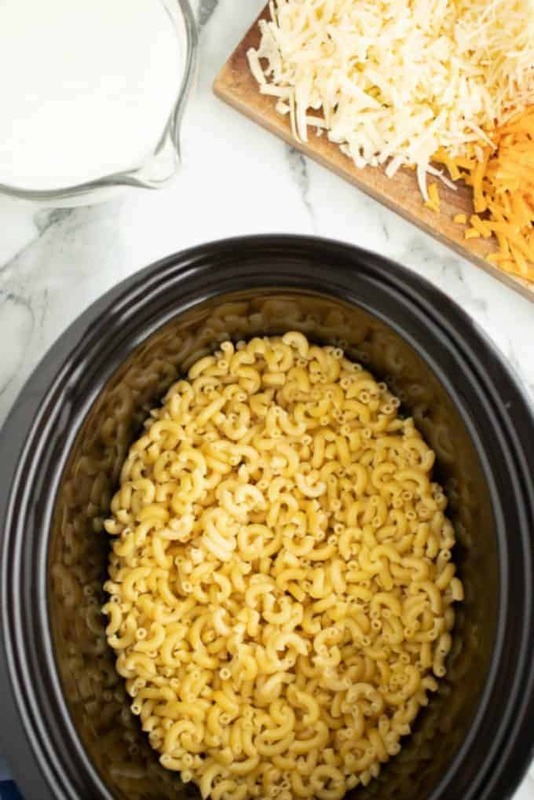 Sure, Kraft Mac and Cheese and Velveeta Shells will always be in my pantry for a quick mac n cheese fix, but If I have a little more time to spend, the crock pot mac and cheese is my new go-to! There is something about the fresh shredded cheese, cream cheese and creamy texture that the slow cooker brings alive to this mac and cheese recipe. A powdered mac and cheese just cannot achieve that creaminess that the real stuff does! Not feeling the crockpot today? We also have a great stovetop or baked mac and cheese recipe. It only takes about 20 minutes to pull together and is great is you are limited on time! 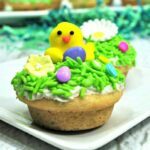 Another thing that I love about this recipe is that it is so versatile. It is perfect for your main dish, but also makes a great side dish! We love to add this mac and cheese to our Thanksgiving dinner as a side. It’s great because our oven is generally overloaded with turkey, potatoes, stuffing and more. This crockpot mac and cheese gives us a way to make an additional dish without taking valuable oven space! Our homemade mac and cheese is also great to serve for a potluck or party! It feeds a crowd and then some! We always bring it to our Super Bowl party and our friends cannot get enough of it! For me, it is a great and simple option for a weeknight dinner. 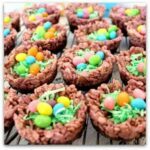 I can start it right after the kids get home from school and it cooks in the slow cooker while we are working on homework and it is finished and waiting for us after their after school activities! This recipe really couldn’t be much easier. All you do is fill a large pot halfway up with water and bring to a boil. Once the water has started to boil, pour in a little bit of olive oil and the box of macaroni. Cook the pasta for 2-3 minutes and then drain. 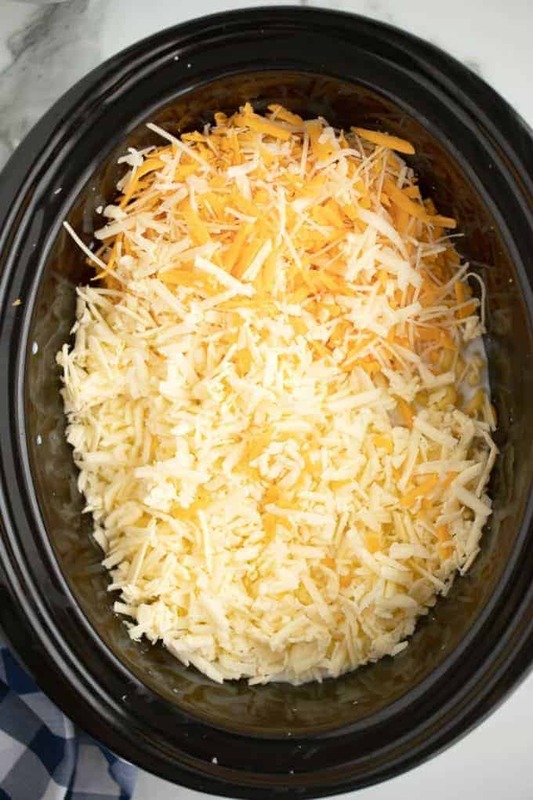 Add the macaroni to a slow cooker/crockpot and add milk, shredded cheddar cheeses, parmesan, and seasonings. Turn the crockpot on low and cook for 1 hour, stirring occasionally. Cut the cream cheese into cubes and stir it and the sour cream in until the cream cheese begins to melt. Cook on low for an additional 20-30 minutes until hot and creamy. While you can cook your noodles in the slow cooker, I don’t recommend it. 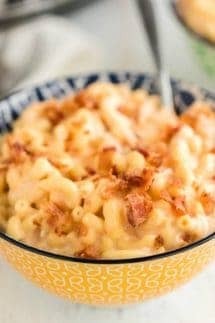 There are many recipes that are no boil crock pot mac and cheese, this one, however, is not one of those! Personally, I don’t think the dish comes out nearly as good when you don’t boil the pasta before putting it in the slow cooker. It is worth the two extra minutes of work to pre-cook the noodles (we want them al dente) to keep them from getting mushy. As with all appliances, not all crock pots cook the same. It is possible that your dish is done cooking a little early or needs a little more time! Not to worry, if it finishes early, just put it on low to keep it warm (we don’t want to overcook and get mushy). Also, if it is not quite finished, let it cook a little longer. Don’t lift the lid of the crock pot if you don’t need to, the steam is important to get the pasta and the mixture to the perfect consistency! Hate the mess of cleaning up your crock pot, try (affiliate) slow cooker plastic liners, they make cleaning up a snap! If the sauce seems too thick, you can add a little bit of milk until you get your desired consistency. 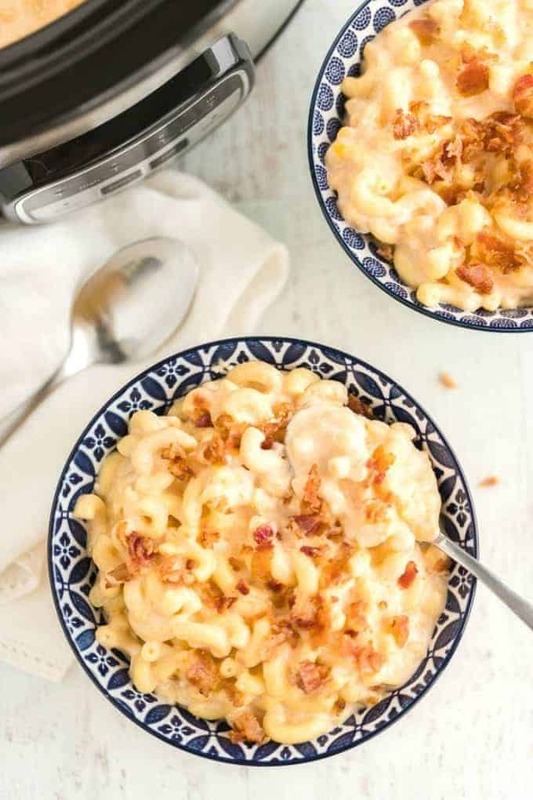 This Crock Pot Mac and Cheese is creamy, cheesy and an easy family dinner that even our picky eaters will devour! Once the water has started to boil, pour in a little bit of olive oil and the box of macaroni. Cook for 2-3 minutes and then drain.